The death occurred suddenly on Monday morning of Mr. Frank Tyldesley, of 38, Castle-st., Tyldesley. Deceased, who was 45 years of age, was well known in the district as a butcher. 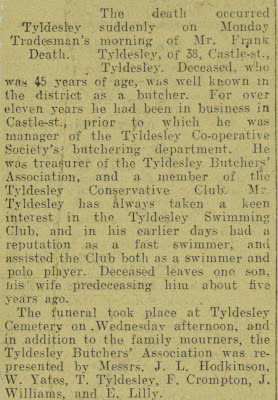 For over eleven years he had been in business in Castle-st., prior to which he was manager of the Tyldesley Co-operative Society's butchering department. He was treasurer of the Tyldesley Butchers' Association, and a member of the Tyldesley Conservative Club. 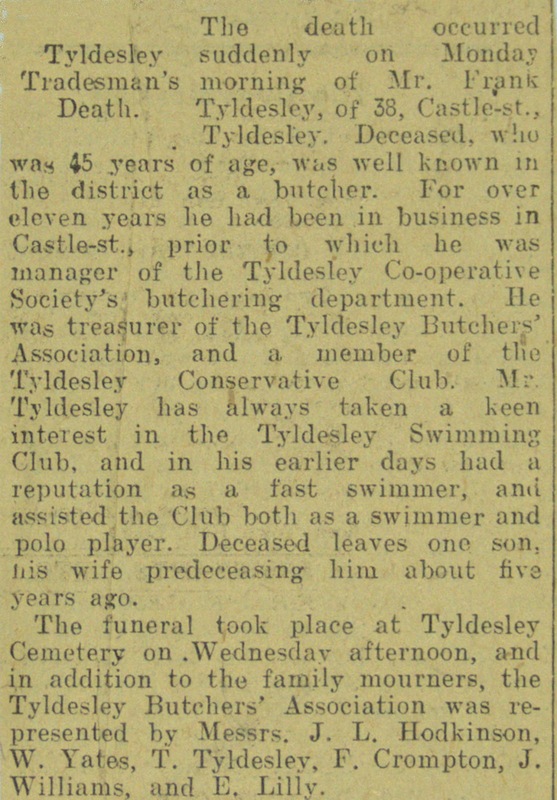 Mr. Tyldesley has always taken a keen interest in the Tyldesley Swimming Club, and in his earlier days had a reputation as a fast swimmer, and assisted the Club both as a swimmer and polo player. Deceased leaves one son, his wife predeceasing him about five years ago. The funeral took place at Tyldesley Cemetery on Wednesday afternoon, and in addition to the family mourners, the Tyldesley Butchers' Association was represented by Messrs. J. L. Hodkinson, W. Yates, T. Tyldesley, F. Crompton, J. Williams, and E. Lilly. Frank Tyldesley was born on 11 December 1879 and died on 20 April 1925. He was brother of Addin Tyldesley 1877-1962 the Olympic swimmer and son of Ralph Tyldesley 1840-1913.